In my make-believe ideal world when September arrived so would cool weather. I suppose the idea isn’t so make-believe depending on where you live. Here in Texas, it’s 100 degrees again this week. But as a friend and I just discussed, I will take my hot summer over a northern cold winter any day of the week. It’s all in what you are used to I suppose. Why the need for cooler temperatures? The State Fair starts soon and I am dreaming about fair food. Funnel cakes in particular. Walking around the fair in a pair of jeans, a light sweater, and a funnel cake. I might have to wait a few more weeks for jeans and sweater weather. 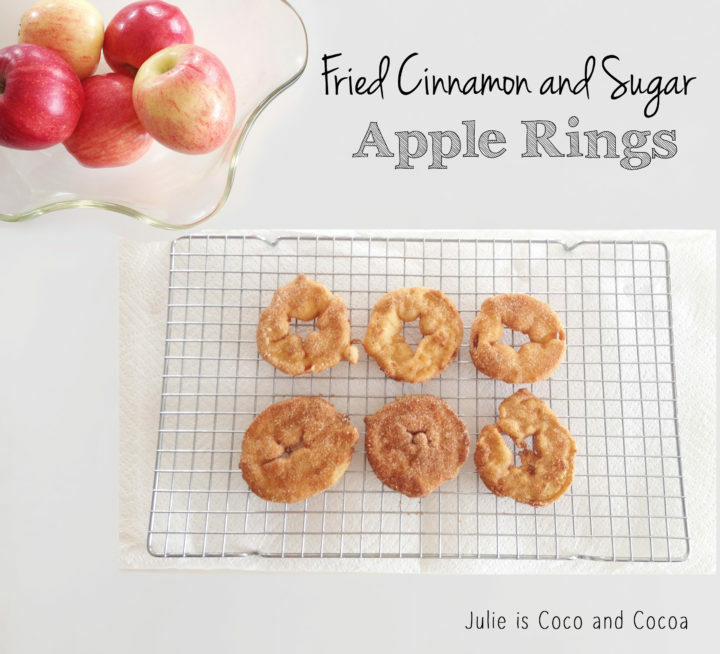 But, I can enjoy these Fried Cinnamon and Sugar Apple Rings right now. These are like fall, carnivals, funnel cakes, and all kinds of amazing fall things rolled into one treat. And I’m trying really hard not to eat them all. Also, I’m failing. All you need are some apples and a few ingredients. 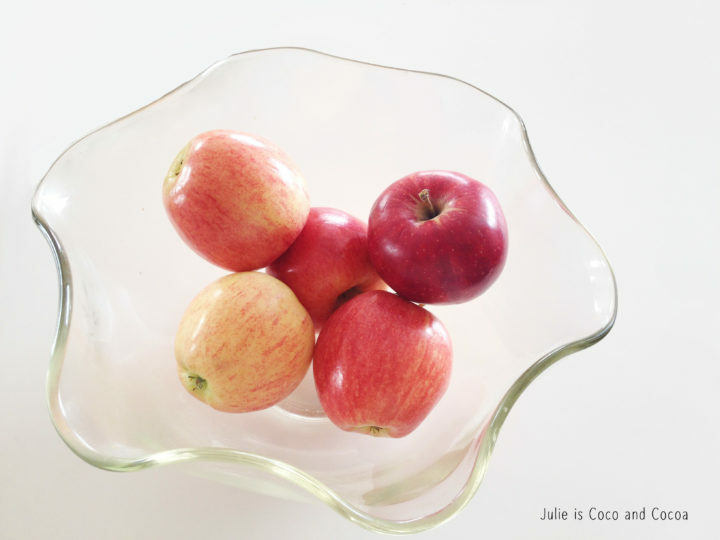 Start by thinly slicing the apples and cutting out the center with the seeds. 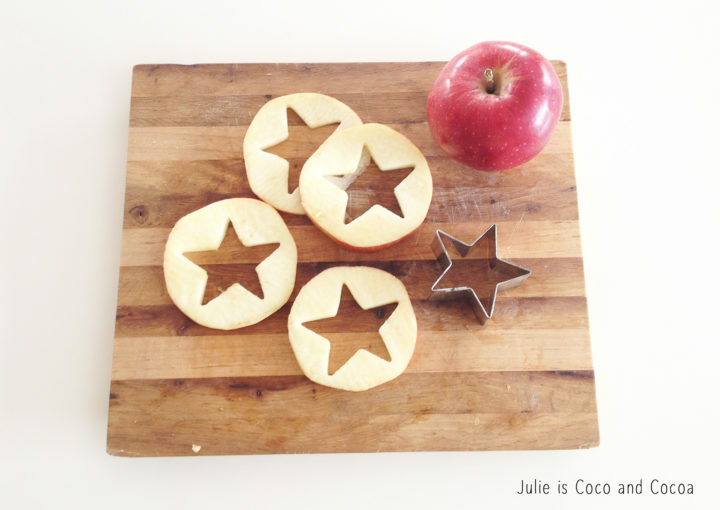 I used my star shaped cookie cutter to remove the center of the apple slices. Once sliced you just dip them in the batter and them fry them. After they are fried you’ll remove them from the oil and place them on a plate with paper towels. After you’ve fried a few, and while they are still warm, dip them in a cinnamon and sugar mixture. Then wait impatiently for them to be cool enough to eat. Prepare the batter. Combine the flour, baking powder, sugar, salt and cinnamon. Then add the buttermilk and egg. Heat the oil in a frying pan over medium heat (approximately 350 degrees). In a separate bowl combine the sugar and cinnamon for the topping. 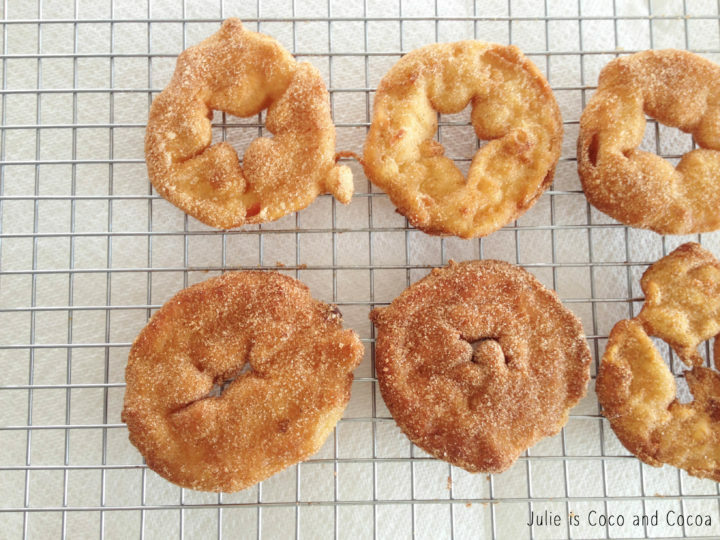 Dip the apple rings into the batter and place in the heated oil. Fry the rings a few at a time, turning them to brown on both sides. Once the rings are fried move them to the plate with the paper towels. 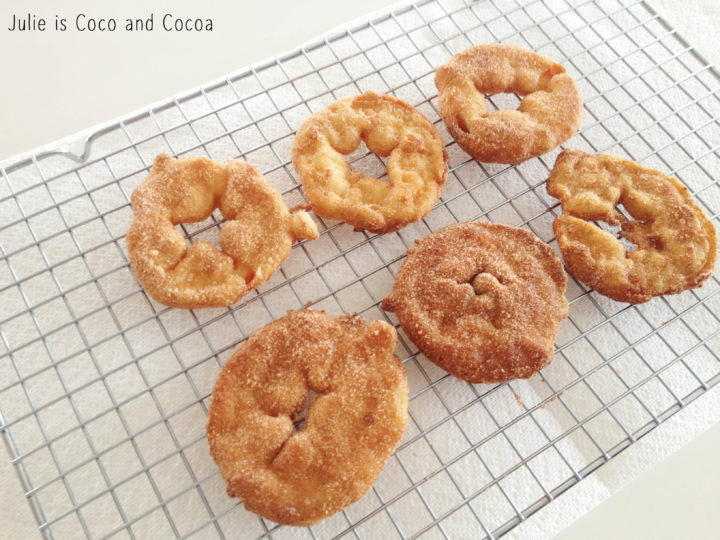 Dip apple rings in the cinnamon and sugar mixture and coat evenly. Place on a wire rack to cool (just enough to eat). Yes, yes you do. They are amazing. oh my gosh, I wish I had an apple because i would be downstairs whipping these up right now! This looks so great! But I’d have to tweak it a bit since I cannot have traditional flour. I’m sure it would be easy to adjust though! Thanks for sharing! I will definitely have to remember this one! Thanks, Susan! And I bet it’s super easy to adjust! We just went apple picking over the weekend.. I will def be making these! So glad you came over from a blog hop! Hope you love the apple rings!! Those look so yummy. Love the star cut out too. I can’t wait to try them. Plus it’s the smallest cookie cutter I had! Sounds so yummy! Legoland has something called apple fries which were divine, so must try these!! I haven’t been to Legoland, but I hope these are similar for you! I grew up eating these as a dinner side dish. I posted my version of this recipe on my website but I need to make it again and take much better pictures. Cute idea to use the star cutter. Thank you so much for sharing on The Inspiration Board at homework. 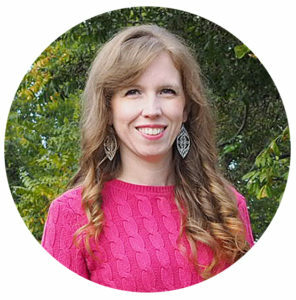 I loved your project and featured you today! Thank you so much for the feature! I hope you are having a lovely weekend! sounds too delicious! thanks so much for sharing on craft schooling Sunday! The only time of year that i actually really fry anything is Chanukah, and I’m sure my family would love this! Yowza- this is screaming “MAKE ME! MAKE ME!” so I guess I know what I’ll be doing tomorrow. 😉 Hugs to you for swinging by Snickerdoodle Sunday with your greatness- hope to see you again tomorrow! Love this! Looks delicious and very easy to make! thanks for sharing! !